Semi pendant lamp by Gubi has become famous for its arc shaped enamelled metal with the shape based on two quarters of a circle. The unique shape of the lamp and the crown silver light bulb give a unique spread of the light around the room. 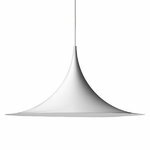 Semi pendant lamp was designed by designer duo Bonderup & Thorup and is available in different colours, from the classical matt white and matt black to shiny metal and colourful glossy shades. Claus Bonderup (born 1943) and Torsten Thorup (born 1944) both graduated from The Royal Danish Academy of Fine Arts’ School of Architecture in 1969 and subsequently went to work together at Danish architect, Henning Larsen’s studio. The two architects teamed up professionally and worked together for the majority of their careers. Together they’ve designed watches and in-store displays for Georg Jensen, the Arktikum museum in Finland and the harbour area in Elsinore, where they designed everything, from urban planning to the ticket offices. 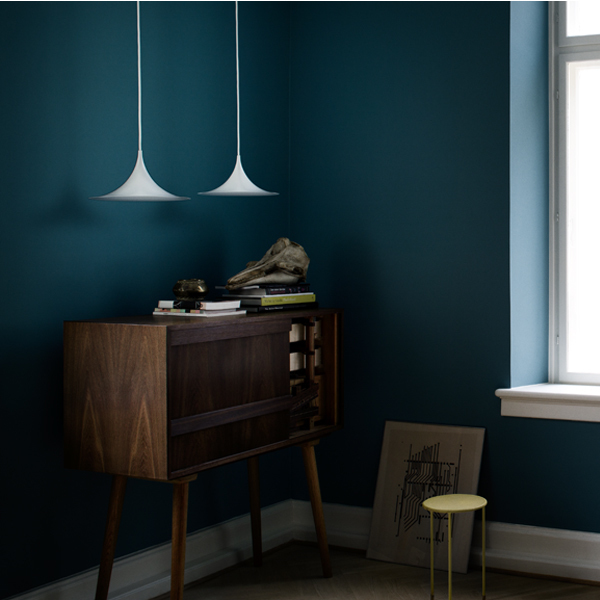 The Semi lamp was designed in 1968 as a product of the creative partnership between two architecture students, Claus Bonderup and Torsten Thorup. 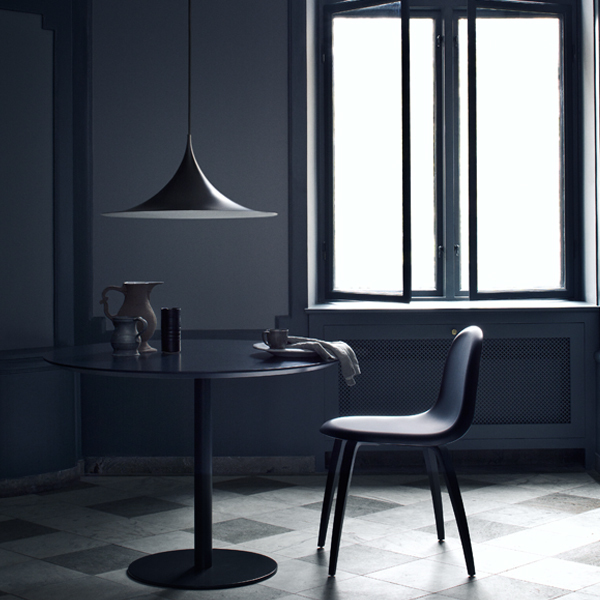 Reacting against the ‘cosy era’ that was dominating Denmark at the time, Bonderup and Thorup wanted to create a lamp that incorporated sharp, clean lines and a geometric shape. Their design was submitted for a competition at the Royal Danish Academy of Fine Arts School of Architecture and won first prize. 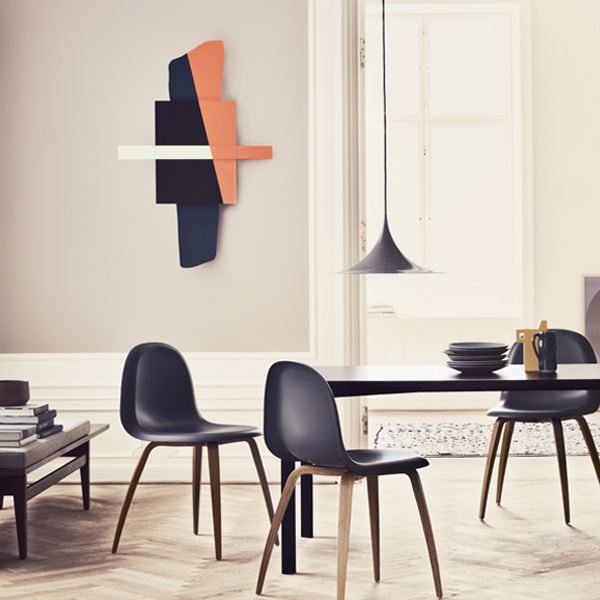 In the 80’s Semi achieved great success and became, at that time, the best-selling Danish design object. In addition it gained a lot of worldwide recognition and achieved the place as a design icon. Still it is an elegant and timeless piece of design, which looks gorgeous anywhere.